It looked like a scene out a Baz Luhrman movie (think Moulin Rouge). It looked like a scene out a Baz Luhrman movie (think Moulin Rouge). The imposing facade of Bikaner House provided the perfect background for the dazzling red, black and white sets of the third edition of The Sunday Standard Devi Awards in New Delhi. It was a full house as the city’s A-listers turned up to watch 12 women achievers being felicitated by the newspaper for displaying dynamism and innovation in their line of work. 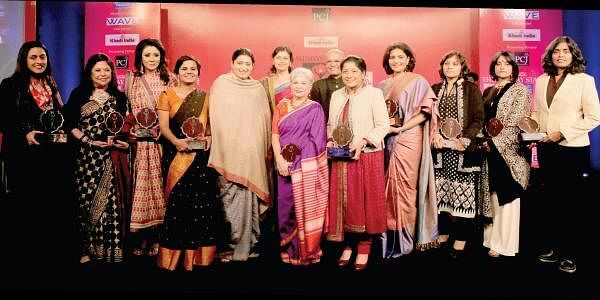 Union textile minister Smriti Z Irani presented the awards. The function began with an introductory address by Editor Ravi Shankar, who stressed that while India has had more remarkable women—from Lakshmi Bai to Rukmini Arundale to Tessy Thomas—than any other culture, it also needs to remember that a nation is only as good as the status of its women. Irani’s speech was followed by a Q&A session with Prabhu Chawla, Editorial Director of The New Indian Express Group. Managing Editor Shampa Dhar-Kamath gave the vote of thanks and acknowledged the partners, PC Jeweller, KVIC, Wave and Paras Buildtech, for their unyielding support and encouragement. The award function came to a close with a lucky dip and a special few going home with gifts from Canali, Illuminatii, Jaypore, Moet Hennessy, MSM and Sarita Handa.